The Waterloo Tower, standing in what is known as Waterloo Clump, is without doubt Burton’s most prominent landmark and can be seen from many miles aways from Northerly, Southerly and Westerly directions. My own house stands at the foot of it and it can be seen from some windows so it is a particularly welcome marker on the skyline on homeward journeys. Aside from magnificent local views, in clear conditions, views ranging as far as Erdington (Birmingham), Cannock Chase, the Weaver Hills and the Peak District. Landmarks such as Lichfield Cathedral can easily be picked out. It was built by local prominent builder, Thomas Lowe and Son Ltd., as the result of an agreement between Burton Corporation and the South Staffordshire Waterworks Company and officially opened on November 30, 1905. The Tower itself is only 30.5m (100 feet) high, but stands on hilltop which is 125m (410 feet) above sea level. This makes the top of the tower over 350 feet higher than the river Trent. It is 15m square with walls 2.5m thick. It was agreed that South Staffs Water would purchased two plots of land, one for the erection of the tower and the other at the bottom of Waterloo clump for a pump engine-house. The object of building the tower was that all the houses in Winshill could enjoy a supply of water sufficient to reach their top storeys. 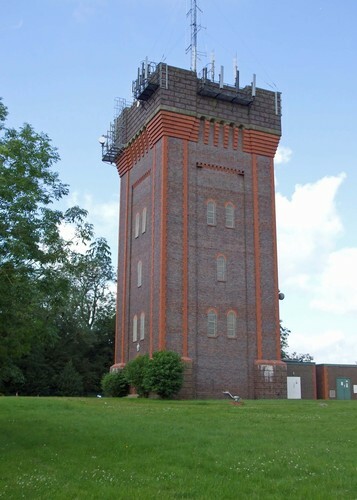 The tower and engine-house cost £6,500, and the Corporation agreed to contribute £1,000. Essentially, the tower houses a huge tank where water for domestic use is stored after being pumped up from the engine-house to provide a large head of water which, due to gravity, could be supplied at much higher pressure than was available from the district reservoir. The water tank itself is cast iron. It is over 3m deep with a capacity of 50,000 gallons weighing 225 tons when full. When built, the tower was much more visible from the town than it is today now that the surrounding trees have grown to maturity. One interesting use of the tower a few years after it built was in conjuntion with the Aviation days held on Bass Meadow. Flags of different colours used to be displayed to the town the state of play indicating for example, that flying had been suspended due to wind conditions or, more excitedly, that another flight was imminent. These days, the top of the tower is crammed with antenna which take advantage of its position. Now that the tower is no longer used for its original purpose, there have been some proposals that it should be demolished and the land re-developed but this has been met with strong protest on the basis that it is such a well known landmark.